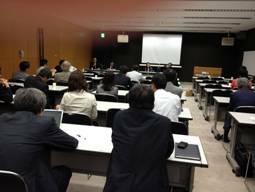 On June 1, Amino Acids Seminar was held at Tokyo International Forum and over thirty participants, ICAAS members or academic researchers, were welcomed by the secretariat of ICAAS Japan. 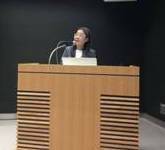 Prof. Kimoto, Okayama Prefectural University and Dr. Miyagi, Kanagawa Cancer Center Research Institute, gave lectures about their research on Amino Acid. In the beginning, Prof. Kimoto focused on the metabolism of methyl arginine. She explained that in the past it was thought that methylated amino acids were not metabolized and were directly excluded from the body. Her studies, however, identified that methyl arginine was mainly metabolized in the kidney and influenced NO production in the blood. Furthermore, she also demonstrated that asymmetric dimethylarginine (ADMA) might be the risk factor for atherosclerosis and heart disease. Thereafter, Dr. Miyagi presented the biology of amino acids in cancer patients. He suggested that the alternation of a single amino acid is very small but combined index, which is calculated from concentration of several amino acids, can discriminate between cancer patients and healthy people.